Louis M. Simon, “Annex Building of the Bureau of Engraving and Printing,” Histories of the National Mall, accessed April 25, 2019, http://mallhistory.org/items/show/457. The original Bureau of Engraving and Printing was opened on July 1, 1880, but by the 1930s, the facility had become too small for all of the Bureau's responsibilities, which included printing money, stamps, and government security documents. 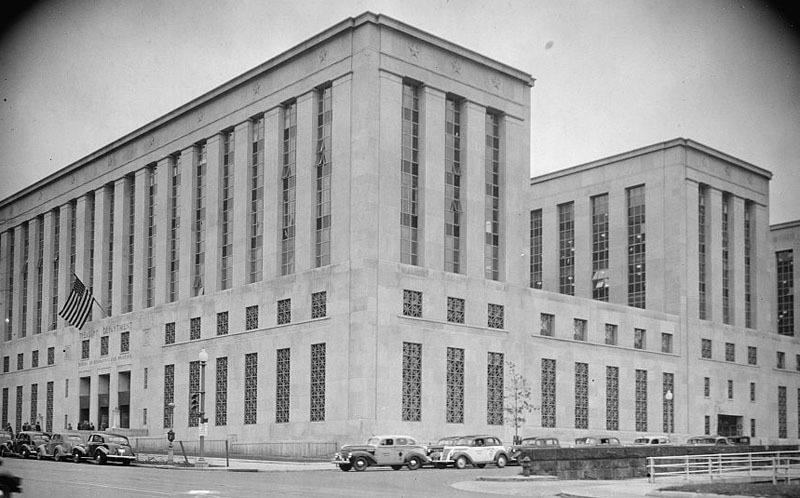 In 1938, a new facility was opened across the street from the original building. Beneath the building are two tunnels, one walkway connecting to the main building and one set of railroad tracks connecting to a freight-receiving building. The tracks are no longer in use. The building has a central corridor with five wings stretching north and south along this line. It is made entirely of reinforced concrete with a limestone facade.